Online reviews are a double-edged sword for today’s business. A firm that knows how to manage reviews well can benefit greatly. Businesses that don’t, or simply deserve bad reviews, can be seriously harmed. Perhaps not surprisingly, some businesses thought they’d try a little legal arm-twisting in order to guarantee good reviews. They began including clauses (known as disparagement clauses) in their contracts that ban customers from posting reviews, or even (in at least one case) clauses that require clients to post good reviews. An example of the former type of contract is that used by Prestigious Pets, in Dallas, TX. 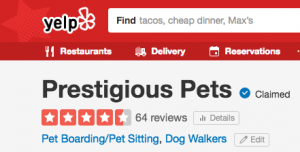 Prestigious Pets, a pet-sitting company, was upset when a customer posted a lukewarm Yelp review. Well, okay, not just lukewarm, but pretty awful. 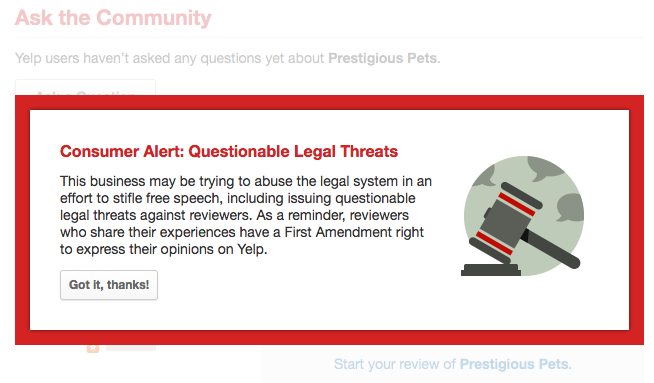 So Prestigious Pets sued; not just for defamation (which is very hard to prove, especially when it’s a real review rather than a malicious review posted by, say, a competitor)… but they also sued for breach of contract. Initially for $6,700 in small claims court, but later for $1million in big-boy court. Think this is a unique event? Not so. Here are a few more examples, from Joe Mullin at ArsTechnica. In the primary story in Joe’s article, the contract even stated that the copyright of photographs taken by tenants in their apartments, and of “written works” about their apartments, would become the landlord’s property. And another … the Union Street Guest House in Hudson, N.Y. had a contract stating that “there will be a $500 fine that will be deducted from your deposit for every negative review of USGH placed on any internet site by anyone in your party and/or attending your wedding or event.” Wow, I wonder how that turned out for them. Now, how about a company that requires clients to post good reviews? Joe Mullin wrote about that, too. The City Park Apartments, in Salt Lake City, had a Facebook Addendum added to their contracts. Not only did the Addendum ban bad reviews, but it required that residents “Friend” the City Park Apartments Facebook page within 5 days, and remain friends with the Facebook page as long as they remained tenants. Such disparagement clauses have never stood up terribly well in US Courts; they usually fail to be upheld. But there are two other reasons businesses should stay away from such practices. First, there’s the new Consumer Review Fairness Act, one of the last bills signed into law before President Obama disappeared on his extended kitesurfing vacation. The FTC (Federal Trade Commission) has recently published regulations related to this Act. This is important to understand. Such clauses are not merely unenforceable, but can be treated “the same as violating an FTC rule defining an unfair or deceptive act or practice. This means that your company could be subject to financial penalties, as well as a federal court order.” Yep, you could be fined. But go ahead, make your attorney’s day, because you’ll pay a fortune in legal fees, too. Another Reason? Consumers Will Hate You! Here’s what I find particularly crazy about Prestigious Pets’ actions. Go look at the top of the Prestigious Pets Yelp review page and click the “Got it, thanks!” button on that Consumer Alert box. What do you notice? They have tons of great reviews! 4.5 Stars with 64 reviews! They should have been pretty happy with that! How about the City Park Apartments? Well, firstly they got terrible, terrible, national news coverage. Then someone posted an unofficial Facebook page that received hundreds of one-star reviews (the page has gone now). Consumer’s don’t like these games; far from helping a firm’s reputation, they can very quickly kill it. That’s if the FTC doesn’t get to you first.